Remember When There Was Such a Thing as Time? Yes yes, those were (will be?) the days, but none of that matters anymore. 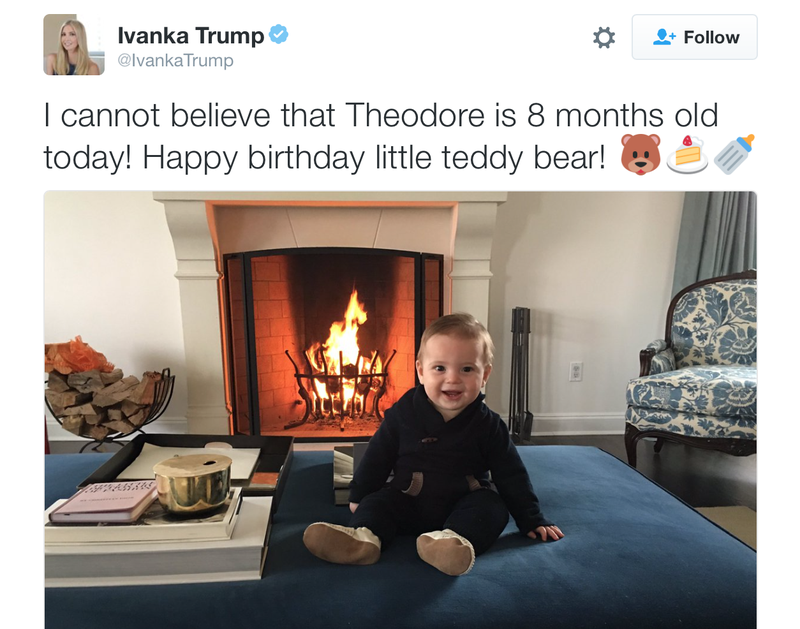 On Sunday morning, Ivanka Trump tweeted this picture of her 8-month-old son, and wished him a Happy Birthday. Some say the “liberal media” is nit-picking and truth-manufacturing in calling attention to this tweet at all. Others say Ivanka made a stupid or careless mistake. But I happen to think Ivanka is right on message and knows exactly what she’s doing—causing people to rush around making distracting, divisive arguments, while simultaneously devaluing language to the point where we no longer can tell the difference between a month and a year. Maybe I’m being cynical...and maybe Ivanka is more well-versed in dystopian imagery than we had once thought. Blow out your candles, America, whether it be today, tomorrow, or yesterday.